The year 2019 started with potential and promises. I had been to Chandigarh with my wife Kiran to direct Mime Workshop from 9 January to 13 January. This workshop was organized by Chandigarh Sangeet Natak Akademi at famous Tagore Theatre where 53 children and young artists of the City Beautiful enjoyed learning of basics of Mime and showcased their talent in Mimes namely “Swachcha Bharat Abhiman”, “Plantation Week V/S Plantation Weak”, “ Road Heroes” and “ Nani ki Kahani, Tab aur Ab”. We also presented three mimes . Before starting the workshop we had a clear vision to present at least one mime on the teachings of Mahatma Gandhi. We had two cute girls Anika and Jaiska Singh who were very active during the workshop and finally exhibited their talent during the final show. Gandhi Ji always emphasized on the cleanliness but very few citizens are concerned and committed towards this healthy habit. The funny Mime showed how we boast ourselves to be clean but in real sense, we are not. We do not even make use of Dust bin. The actors come on stage to contribute garbage in their own style. Two little girls help the Safari Karmi(Cleaner) to put garbage spread over by people into the dustbin and get instant appreciation by the Safaikarmi and the audience. Thanks to Shri Kamal Arora, Chairman, Chandigarh Sangeet Natak Akademy, Chandigarh and his team for organizing the Mime Workshop. I was also invited by the Anthropological Survey of India (Western Regional Centre), Udaipur to present a paper on Mahatma Gandhi: Tribal and Rural Development on 30 January.I decided to present a live and interactive session on role of the Tribal and Folk art forms in Rural Development focusing Behrupia art. With my experience of National Behrupia Festival and Gandhi Parv organized at Indira Gandhi National Centre for the Arts, New Delhi in October,18, I thought to introduce Sikandar Abbas Behrupia as Gandhi again during this Seminar especially on the 30 January ( Death Anniversary of Gandhi ji ). 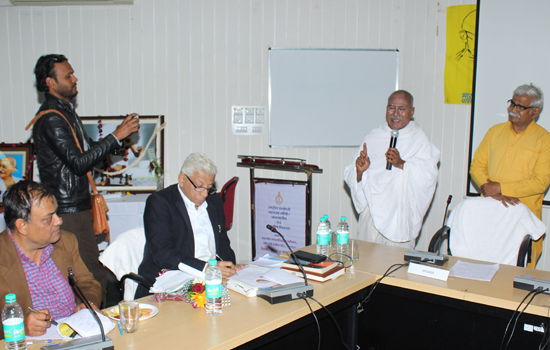 The script of the presentation was carefully written imbibing the teachings of Gandhi ji with innovative inclusions. Sikandar Abbas appeared as Gandhi ji and delivered his speech with proper pace and impressed every participant coming from various parts of India. Sikandar as Gandhi ji showed his concern over the consumption of liquor by the young generation. He also advocated for cleanliness. The concept of adding two more monkeys apart from “Bura Mat Dekho, Bura Mat Suno and Bura Mat Kaho” were appreciated and these were “Bura Mat Socho and Bura Mat Soongho” showing concern over ill thoughts and pollutions. Sikandar received a standing ovation and every participant accompanied him in singing “Raghupati Raghav Raja Ram” at end of the presentation. Prof. Vinay Kumar Srivastava, Director, Anthropological Survey of India, Kolkata, and Prof B. P. Bhatnagar, Former V.C. J.R.N.Rajasthan Vidyapeeth University and Convener, INTACH, Udaipur along with other dignitaries applauded the efforts. This Seminar had 40 papers from various disciplines. I was equally benefited with the views of professionals, Academicians, Field Workers and Research Scholars about Gandhian Philosophy in Tribal and Rural Development.